The Sand Mandala is a Tibetan Buddhist tradition involving the creation and destruction of mandalas made from colored sand. 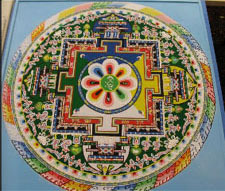 A sand mandala is ritualistically destroyed once it has been completed. However they are sometimes left to emanate blessings form the deities they represent. Paleaku is fortunate to care for two beautiful sand manadals one is on healing” Medicine Buddha ” and one is “Chenrizig, The Buddha of Compassion. 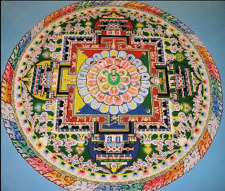 ” .Historically, the mandala was not created with natural, dyed sand, but granules of crushed colored stone. In modern times, plain white stones are ground down and dyed with opaque inks to achieve the same effect. Before laying down the sand, the monks assigned to the project draw geometric measurements associated with the mandala. The sand granules are then applied using small tubes, funnels, and scrapers, until the desired pattern over-top is achieved. Sand mandalas traditionally take several weeks to build, due to the large amount of work involved in laying down the sand in such intricate detail. It is common that a team of monks will work together on the project, creating one section of the diagram at a time, usually working from the center outwards. These sand paintings were done by the monks from Dzongkar Choede monastery. 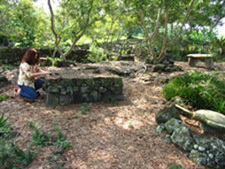 This small Hawaiian Heiau (a spiritual altar) is where prayers are offered to the Aumakua, the guardians of the land at Paleaku. These ancestral spirits take the form of animals. The Io, Hawk, and the Honu, Turtle, are Paleaku’s guides. Here the land, sky, and water join in a harmonious arrangement. 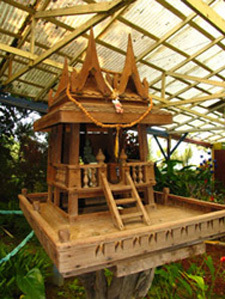 The Spirit House is one of the most fundamental features of Thai Life. Spirit Worship is as old as mankind itself. Today, many of the old animistic beliefs are intertwined with Buddhism and some animistic practices still exist in Thailand. One of these which is practiced by every Thai is the Spirit House. The purpose of the Spirit House is to provide an appealing shelter for the spirits, or celestial beings, who would other wise reside in the heavens. The Spirit House is for the Guardian of the Gardens. This spirit watches over and protects the natural surroundings, yards, and orchards and those that walk the gardens. This shrine is a representation of the Hebrew teachings of life. It stands on a base of Ohia wood from the forest of Mauna Loa. 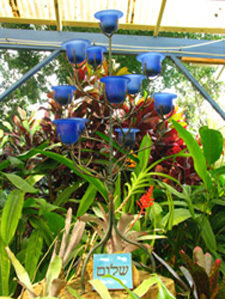 The blue glass candelabra was donated by Carol Burstein in 1996. Born in Nepal in the 6th century B.C., Buddha was a spiritual leader and teacher whose life serves as the foundation of the Buddhist religion. The Buddha is undoubtedly one of the most influential figures in world history, and his teachings have affected everything from a variety of other faiths (as many find their origins in the words of the Buddha) to literature to philosophy, both within India and to the farthest reaches of the Western world. The center Buddhist statue is from Bali and on either side are Tibetan Statues representing the rich cultural manifestations of the Buddha and His teachings. The goddess Kwan Yin knew all about suffering. In her first life in India she was born as a male named Avalokitesvara, who sought to help poor lost souls be reborn to a better life on their journey to enlightenment. But he was overwhelmed and anguished when more lost souls kept coming in what seemed an endless cycle. In his despair he shattered into a thousand pieces. He reincarnated as a woman, a female goddess to bring compassion and mercy into the world. She had a thousand arms and eyes in the palms of each of her hands so that she would always see the people’s distress and be able to reach out to encircle them. When she came back to earth she was so successful at comforting the people, word of her began to spread to other lands and other religions. “We need her here,” the people cried. And so she went, reincarnating herself wherever she was needed. Known by many names and stories in many places, she was revered as a Buddhist deity and then a Taoist one. She is known as the goddess Tara in the Himalayas and Mazu in her incarnation as the goddess of the Southern Seas, but she is best known by her Chinese name, Kwan Yin (also spelled Kuan Yin), the Goddess of Compassion. Depicted in statues and paintings, the Goddess Kwan Yin often appears as a calm, gentle woman of middle-age who radiates serenity. 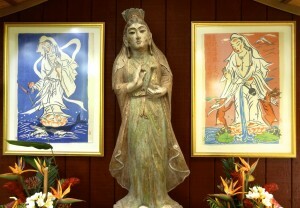 She is sometimes referred to as an Asian Madonna. 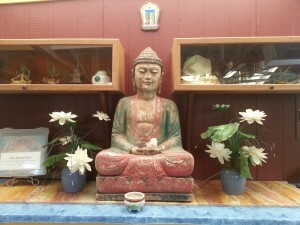 Kwan Yin is a protector of women, especially those who yearn to have children. She is also has a special connection with sailors, merchants, and those who are imprisoned.